We waited a long time, but now finally a Tesla Model 3 is parked in front of our office in Berlin and I could drive it for a whole weekend. In this report, you'll learn what driving an electric car feels like, and what Tesla does well, but not necessarily everything is better than with the established car manufacturers. 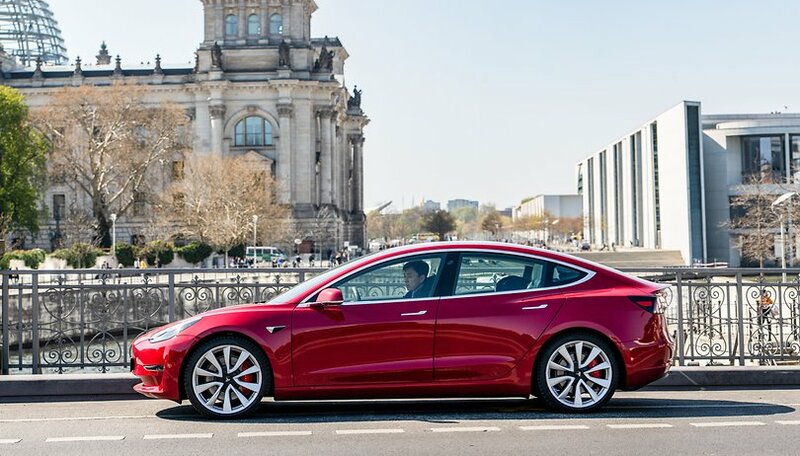 When the news came that I was allowed to pick up the Model 3 from Tesla in Hamburg for AndroidPIT, I was as excited as when I first received my father's car keys right after my driving test. Back then (that was now 28 years ago) driving a car was still very simple: put the key in the lock, turn it, the engine started and you could drive noisily from the parking lot. Theoretically, it would have been just as easy to get going in the Model 3, but it is necessary and recommended to allow yourself the time to understand the car beforehand. Mostly because the operation needs a little explanation, as almost the complete control is done via the huge and centrally arranged touch display. There are two steering columns and two switches with rotary controls on the steering wheel, as well as the two legally required individual buttons for hazard lights and emergency warning on the dashboard, but that's it. All other functions are controlled via the central display. But more about that later. After a detailed introduction to all the functions of the Model 3, the friendly Tesla staff left the car to me. So, with the keycard on the center console, I pressed the selector lever once and the first experience came. Nothing vibrates. there's no engine noise. A slight buzzing comes from the underbody, where the batteries are located, which are now brought to the optimal temperature. The range is a full 488 kilometers and my destination is only 300 kilometers away. According to the navigation, I should be able to arrive in Berlin with almost 10 percent residual energy. This forecast is based on the driving style of the previous tester, who was not very gentle with the Model 3, and the not exactly ideal temperature of eight degrees Celsius on that day, so I should be able to reach my goal easily without a stopover if I am easy on the gas pedal. Slowly and comfortably, thanks to the rush hour in Hamburg, we headed towards the motorway. Murming at best, it was quiet. On the display, the Tesla shows the vehicles in the immediate vicinity while driving and recognizes whether it is a car, bus or truck. Even cyclists and pedestrians are often correctly detected. The detection rate is certainly not 100 percent, but the eight cameras, the radar and the software do a good job. After an eternity of rush hour traffic, the motorway towards Berlin finally came into sight. The remaining range at this point was still well over 400 kilometers and I was confident to leave the two strategically placed superchargers from Tesla behind. For the first hundred kilometers, I let the Baby-Tesla drive in "autopilot" mode towards Berlin. This semi-autonomous driving actually worked well. When coming up on a slower car or truck, the electric car adapts to the speed of the vehicle in front, but it is more exciting to set the indicator for an overtaking procedure because then a sensor and the computer-aided overtaking procedure is triggered. The first "automated" overtaking process failed, but this was not due to the system, but rather to the human automatism and the learned processes. Basically, the process was aborted by my intervention. A second attempt, in which I deliberately held back, worked very well and gently. The autopilot in the Tesla Model 3 is both fascinating and frightening at the same time. Speaking of restraint, given that our test car is a Model 3 Performance model, you can easily lose it. Especially when you are forced to make room on motorway sections without a speed limit (in Germany, large parts of the Autobahn are unrestricted) by a fast-moving sports car that is getting bigger and bigger with its headlamp flashing in the rearview mirror. In this situation, you can take advantage of one of the secret weapons of an electric car: the power that is available immediately. With the Model 3 Performance, you only have to put your foot down and the car starts racing in line with the adrenaline in your body. On long distances, however, one should rein in a heavy foot as much as possible, because the range suffers. In my case, I would have just made it to the office, but only with 5 percent of battery left. I preferred not to take this risk and loaded the car at the last supercharger station before Berlin for 20 minutes, so that I arrived with a remaining range of about 220 kilometers. As the father of a family, who normally drives a middle-class station wagon, the suitability for everyday use with a child was of course also in the foreground on my thinking. What you don't see with the Model 3 is that it can be used in everyday life by a family of three. A child seat fits without the driver or passenger in the front being forced to rub their knees on the glove compartment. A weekend shop including crates of water can easily be stowed in the boot. Some elements are as impractical as the space available is suitable for everyday use. For example, the child safety lock on the doors cannot be activated for each individual rear door, but only for both. The chic, recessed door handles are also useful for adults, but too complicated for children. Even most adults had trouble to understand the principle of pushing and pulling the lever right away. The parking assistance system proved to be very selective in our test vehicle. So far I have only managed to find a parking space that the system also recognized once. Perhaps European parking spaces are simply too small for the American Tesla. All in all, the Model 3 from Tesla is a family car that can also be used as a sports car. Of course, on long tours, you have to think about where to stop for charging when planning the route. But it should be easy to get used to that if you decide to buy an electric vehicle. But the long distances are not the real problem, because the real issues lurk more in the environment in which one lives. You should find out in advance where there are charging stations and what you need. The navigation system of the Tesla Model 3 can always show you to the closest charging stations, but these are only the official Tesla SuperChargers or the so-called Destination Chargers. The latter are usually only accessible to customers of the landowner (hotels, restaurants or similar). Much remains to be done on the charging infrastructure for EVs. At the charging stations on public roads, it looks as if it would be best to register with several operators and, if necessary, also order a corresponding charging post card. For the first weekend in Berlin, I used the App Plugsurfing, because I didn't need any additional hardware. But then I had to live with a limited choice of charging stations. Despite the Plugsurfing App and Tesla's own charging infrastructure, life with an electric car is not as easy as with a car with a combustion engine. The external conditions and your behavior at the steering wheel strongly influence the range of the Tesla Model 3, but the (admittedly constantly growing) charging infrastructure causes me a little frustration because of the confusing price models and the different possibilities of paying, especially because as a resident of an apartment building, you cannot simply use the socket in the underground car park and the installation of a wall box is expensive and complex. So I had to go late on Sunday evening, when the family weekend with the Tesla was over, to drive the Tesla five kilometers for 30 minutes on a charging station. I killed the charging time with some YouTube videos of the Tesla Model 3.
there are aspects of the Tesla line that reflect some US centrism. As usage increases, apartment owners will need to adress charging options for their residents.